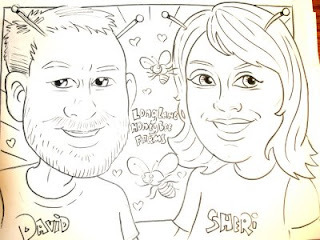 Hello from David & Sheri Burns at Long Lane Honey Bee Farms in East Central Illinois. I once asked the audience at one of my presentations to give a show of hands as to how many were raising their own queens. No hands went up. I asked a second time, because I thought maybe they didn't hear me. Still no one. I was amazed at how few beekeepers raise queens. And yet the queen is the most important bee in the hive. No doubt, a lack of courage and confidence in raising queens keeps many beekeepers from attempting to raise their own queens. Many beekeepers never really become beekeepers, but only remain bee-havers. They have bees, but they really don't work or manage their bees. There are many reasons why people remain bee-haves and never become beekeepers but I think one of the biggest reason is FEAR and a lack of courage. The second reason is similar and that is a lack of confidence. Many beekeepers just don't feel confident in knowing what they are doing. They are afraid that their lack of "knowing what they are doing" will result in doing something wrong and killing their hive. This is why most beekeepers never raise queens. To them, the place where the queen lives is mysterious and so deep within the hive, a place where no man has gone before. Every year thousands of "beginner" beekeeping courses are given around the country. These are great to help beekeepers get started, but there is rarely a follow up mentorship or advance class. As a result most bee-havers know enough to install a package, dump expensive and unnecessary medication on their bees, watch them die in the winter and buy packages the following year only to repeat the same techniques that may have led to their bees failing the first time. We've got to break this cycle! With a bit more education and mentorship, a bee-haver can become a beekeeper and develop a level of skill, knowledge and confidence that can catapult their beekeeping hobby to a whole new level of success. Education is the answer. 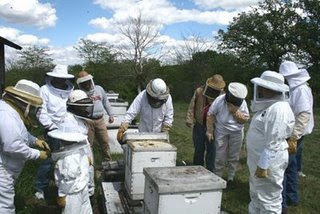 But no matter how "book-taught" a beekeeper is, the best education is through a hands on course. Another way that you can build your confidence and courage in beekeeping is to catch swarms. Swarms rarely sting and always draw an audience. It builds your confidence to retrieve a swarm and place it into your bee yard. Once people hear that you keep bees, they will be calling you asking you to remove a swarm. 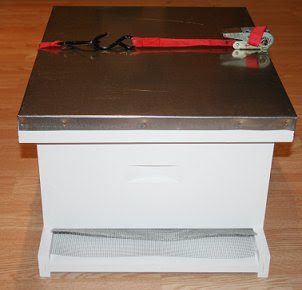 We've build a perfect swarm catch box so you can place the swarm in it and transport it back to your bee yard. Click here for more information. It comes with a screen to shut off the front entrance once the swarm is captured as well as a tie-down strap to hold it all together for transport. Every beekeeper should have one just in case your own hives swarm on you. You can catch them and keep them as a new hive. This extra hive will build your confidence know that you have extra equipment should you want to raise an extra queen or keep a smaller hive going or to support an observation hive. Lots of uses. During the month of May, many beekeepers call us and want us to rush a hive to them because they found a swarm. But, by time the hive arrives the swarm has left. So have one on hand! It is worth the investment. It will nearly pay for itself in one swarm catch because you save the cost of a package of bees. We are here to help you keep bees with courage and confidence! Feel free to call at: 217-427-2678. Until next time, remember to bee-have yourself! Your blog is amazing, seriously. It`s simple, "client-oriented" sorry if that`s not the word, and accompanied with lots of pictures. I have just started my beekeeping maraphon, a month and a half ago, and find your blogspot extremelly usefull. I love your blog, I have been so confused on many beekeeping issues and you have helped me to resolve those!! I so love it, keep up the good work!! I am not a beekeeper but reading through your online classes on honeybee removes from my mind all the confusion I had. I feel now I can start keeping bees with much confident and as an experienced beekeeper. I like so much this post about confidence.